Published four times annually (Spring, Summer, Fall, and Winter/Holiday), Keeneland magazine provides in-depth coverage of legendary Keeneland Race Course and the Keeneland “lifestyle,” including the color, excitement, tradition, style, and sophistication of Keeneland and the sport of Thoroughbred racing. Racing as it was meant to be. Regular features include profiles of influential members of the Thoroughbred industry as well as fascinating Central Kentucky residents. The cultural and dining scenes also are featured. Keeneland Race Course is located in Lexington, in the heart of Kentucky’s famed Bluegrass region. No other magazine captures the spirit and majesty of Keeneland and the sport of Thoroughbred racing like Keeneland magazine. Distribution of Keeneland magazine is now the most extensive ever. 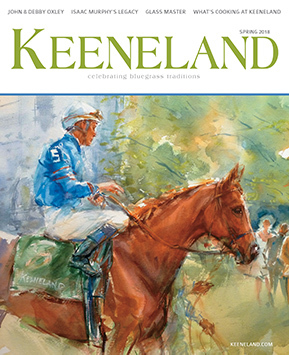 Keeneland magazine is available on numerous local, regional, and national newsstands, at Keeneland Race Course, and other venues across the country. Keeneland magazine is a must-read for an upscale, affluent audience of horse people and enthusiastic racing fans across the Bluegrass and around the world. In addition, Keeneland Race Course mails a complimentary copy of each issue to every member of the prestigious Keeneland Club. This puts your advertising message in front of many of the most affluent and influential members of the Thoroughbred community. And to complete this prime distribution to top horse people, Keeneland magazine is also mailed to Keeneland’s sales catalog and newsletter mailing lists. This ensures that your message reaches the thousands of top breeders, owners, and trainers who come to Keeneland several times each year to buy millions of dollars worth of the best racehorses and breeding stock in the world. Published by BloodHorse, publisher since 1916. Copyright © BloodHorse, LLC. All Rights Reserved.